Drive-Master offers Side Entry Wheelchair Accessible Van Conversions for the Toyota Sienna with BraunAbility, VMI Vantage Mobility and Eldorado Amerivan. Below are all the different Toyota Sienna Side Entry Minivan Conversions we offer. The Toyota Sienna side-entry Power XT fold out ramp wheelchair van offers the same accessibility and convenience of any BraunAbility vehicle, all in a more streamlined package. This popular chassis includes a sleek exterior and impressive interior options. The van’s automatic kneeling system lowers the rear suspension and allows for a gentle ramp slope and an impressive 56″ sliding door height. Freedom of choice, that’s what the Toyota Power Infloor Wheelchair Van adds to our already diverse product line-up. BraunAbility’s first infloor ramp option stows away neatly under the floor, allowing for obstacle-free entry and exit for ambulatory passengers. 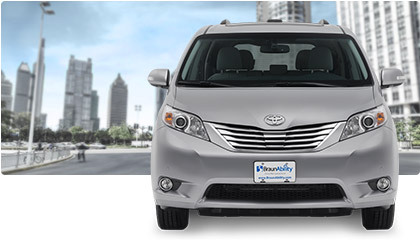 The VMI Toyota Sienna Northstar Access360 is a top-of-the-line wheelchair-accessible minivan. It gives greater access to life through more space, flexibility and ease of use. With a power slide-out, in-floor ramp, users get less dirt and debris in the interior and optimal maneuverability for larger power chairs. The Toyota Sienna Northstar E360 is the ultimate solution for caregivers of power wheelchair users. The Northstar E360 combines VMI’s one-of-a-kind, manual in-floor ramp with industry-best interior space and legendary Toyota reliability to deliver unbeatable value for caregivers. It includes a manual in-floor ramp, maximum door height to accommodate wheelchairs of all sizes, and an obstruction-free interior. The Toyota Summit Access360 gives wheelchair users independence and freedom by providing the most usability, space and flexibility at a great value. Designed to accommodate larger power chairs, this wheelchair van delivers a fold-out ramp with tall side rails for easy ramp navigation. Setting new standards for quality engineering, creative design and meticulous craftsmanship, the Toyota Sienna Amerivan provides practical solutions to today’s mobility challenges. The Amerivan offers a Power Fold Out Ramp, Stainless Steel Flooring, 31″ wide Ramp and 56″ door opening for greater entrance and interior height.